While I thoroughly enjoyed the original Mass Effect, the sequels improved upon the gameplay and storytelling significantly. 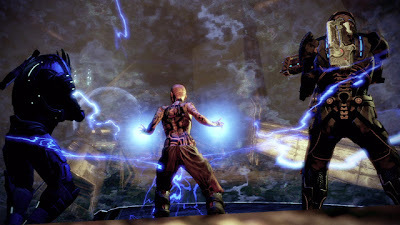 The first game provided a glimpse of the greater universe that you actually get to explore in the sequels, and while there are certainly elements of BioWare’s Knights of the Old Republic that inspired the Mass Effect games, the homeworlds and cultures of the Asari, Turians, Krogans, Hanar, and so on feel strikingly original. These two games run incredibly close for me. While neither is perfect, they both have their strengths and weaknesses that ranks them at approximately equal quality in my eyes. Mass Effect 2 was more reliant on shooter mechanics, but offered a greater host of side missions and squad members. Mass Effect 3, though more focused on reaching the end of Commander Shepard’s story, brings back many traditional RPG elements absent in ME2 and offers fewer squad members that, while specialized to one role or another, are more adaptable than in the previous installment. Above all else, what impressed me most about the two games was the weight of your decisions and how it impacted the manner in which the greater story unfolded. The original Mass Effect forced you to choose one human squadmate to live and the other was left to die, but these were characters that I frankly could not have cared less about. Sure, there was the romance subplot, but it only offered two options per gender. Mass Effect 2 rectified all of this by including loyalty missions – sidequests that would earn Shepard the trust of his squadmates. Opt not to complete a loyalty mission and there’s a good chance your pals might not survive to the end of the game. As for the romance subplot, there were significantly more choices available to both male and female Shepard, each of them arguably more interesting and involved than those offered in ME1. Mass Effect 2 required much more time and attention than the first game, but it also gave a lot more back. It was a game that allowed you to play however you wanted, and your decisions would carry over to Mass Effect 3. The characters you allowed to live would appear in Mass Effect 3, potentially offering you assistance in your fight against the Reapers, while those who died might be mentioned in dialogue, but were otherwise nowhere to be seen. The Mass Effect sequels are phenomenal spiritual successors to the Knights of the Old Republic titles as well as the original Mass Effect. Gone are the clunky periods of exploring uncharted worlds in the Mako, gone are the repetitive landscapes and underground bases - all replaced with planets that exude a sense of adventure. While BioWare’s love for space operas like Star Wars are clearly visible in the art and story direction of Mass Effect, these games host their own lively universe - one that was equally creative and engaging. Whether Shepard is investigating a string of disappearances on human colonies, securing the last hope of curing the Krogan genophage, or helping to beat back Reaper forces from one of the moons orbiting the Turian homeworld, each quest is uniquely exciting. Over the years, Game Freak has done quite a bit of experimenting with the Pokémon series, between the core entries and the side games/spinoffs. While still a six-member party RPG game, the inclusion of dual types and special abilities provided a new dynamic to strategies players would adopt. However, the Generation IV titles Diamond, Pearl, and Platinum were less well-received by many in the Pokémon community following their release, due to a number of factors including a lack of balance in the representation of the then-seventeen types, as well as some new evolutions of pre-existing Pokémon that some fans considered entirely unnecessary. Thus, the Generation V games known as Pokémon Black Version and Pokémon White Version saw Game Freak perform a sort of balancing act between the new and the old. The fundamentals of the game were retained, and many familiar tasks were streamlined to better utilize the DS’ hardware. Trading was no longer handled through the Pokémon Centers – rather any player could access the ‘trade’ and ‘battle’ options on a whim via the handheld’s lower screen and interact accordingly with a friend/opponent nearby. The simple act of combining the Pokémon Center and PokéMart into a single building proved to be a giant time-saver. Meanwhile, the one-hundred and fifty Pokémon players could catch in Black and White were all new, with access to Pokémon from previous generations being restricted (outside of trading) until the sizeable post-game section. The types were carefully chosen to create a near-perfect balance. 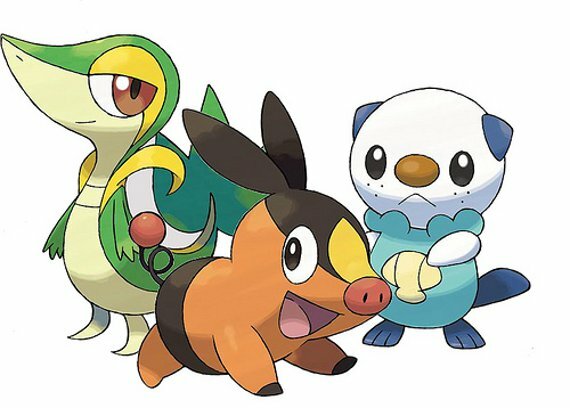 Though some generation V Pokémon were perhaps more ideal to certain players than others, the fully evolved form of each Pokémon had a practical use and could serve to complement a party well. The Elite Four put up a solid challenge, and the concept of having the antagonistic Team Plasma’s desire be the liberation of Pokémon from their owners/partners made for a strikingly original and entertaining spin on an old classic - one that was mildly more thought-provoking than the plans laid out by previous baddies who wished to drown/dry up the world or mess with the time-space continuum. Everything Game Freak implemented in Black and White, they did so with good reason, and the games stand out as what I would consider to be among the best in the series as a result. There’s a decent degree of challenge, though the game allows for a great range of freedom with selecting party members and strategies. Above all else, Pokémon Black and White are just plain fun to play. 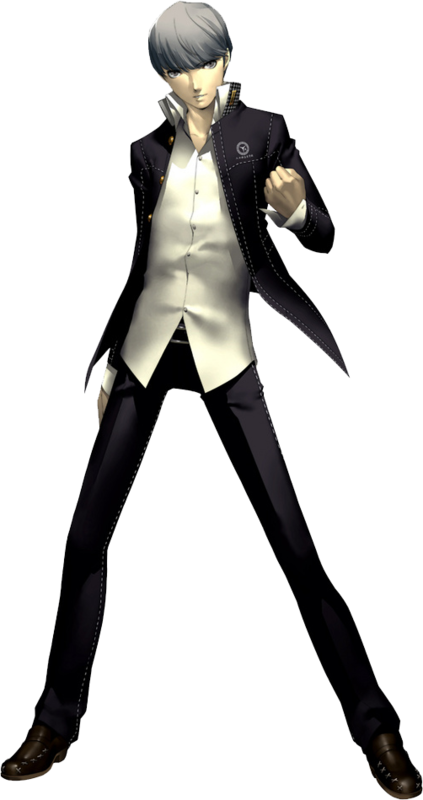 I’ve been playing quite a few JRPGs as of late, and while I have every intention of returning to both Final Fantasy VII and X in the not-too-distant future, I’ve decided to mix things up a bit by playing Persona 4 on the recommendation of a few friends. As I post this first journal entry, I have completed little more than the tutorial phase of Persona 4 – i.e. the first two hours. I’ve been shown the ropes on the game’s combat and how to use the lead protagonist’s Persona. And while that’s all rather basic, I can appreciate it for the sole fact that the game bothered to give me a rundown – sure it was a bit lengthy, but I’d rather have a long tutorial segment than be dropped into the thick of battle with no indication of what I’m supposed to do/how I’m supposed to do it (which was unfortunately the case with my recent attempt to play my first Fire Emblem title, Radiant Dawn). Though I’m still being introduced to the main cast and have yet to meet about half of my remaining party members, I like the group so far. They fit into typical roles you’d expect of any anime without falling into the territory of the cliché. Yukiko might be popular with the boys, but she’s frequently unaware of when she’s being asked out on a date. Yosuke is a goofball and is annoying to a certain degree, but not so consistently that I’ve found myself fed up with his antics – it's a balance that is seemingly difficult to find in anime and video games of this nature. It’s refreshing that Chie is the one who is more frustrated with Yosuke than I am. Chie is a quirky character as well due to her interest in kung-fu movies and role as being arguably the most masculine party member thus far. While I would like to have some more interactivity with the school and home segments, I realize I’m only a little over two hours into the game and these will likely come along soon enough. The whole concept of entering the television realm and attempting to piece together clues from the murders is an interesting combination of classic elements of the genres/entertainment mediums Persona 4 draws from. While I certainly know more about my protagonist’s daily life than I do about the television realm or the murders, the game has been progressing its story at a nice rate, leaving me just enough in the way of metaphorical bread crumbs to keep me entertained. For my first experience with a Persona title, I'd say things are off to a pleasant start (the game's serial murder theme aside). The first-person shooter is generally one of my least favorite genres in video gaming, due to the sheer number of FPS titles that are released each year with minimal effort or inspiration. As much as I have enjoyed the Halo series over the years, it is still rather surprising to me that Bungie’s swansong to their monumentally successful series landed a spot this high on my top ten list. 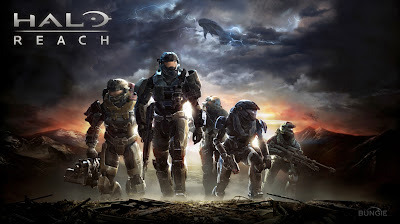 While I will always consider the story, gameplay, and multiplayer offerings of Halo 2 to be the best in the series, Halo: Reach follows not far behind the title that essentially shaped online gaming for consoles into what it is today. The tale of Noble Team is really a side story to the main tale of Master Chief and Cortana. While the fall of planet Reach is one of the most pivotal events in the Human-Covenant War, it’s content that is largely unfamiliar to anyone who has not read the Halo novels, and NPCs only make brief mention of the battle in any of the three main games or spin-off title ODST. Witnessing an earlier conflict in the Human-Covenant War firsthand is entertaining and does well to separate the story from the all-too familiar routine of Master Chief blowing away every Covenant and Flood foe that stands in his way. But throwing five squadmates into the equation, giving them each a unique and interesting personality, and showing players just what is at stake with the loss of a planet so critical to UNSC operations lends to Halo: Reach an atmosphere notably different from previous Halo titles. While dual-wielding was done away with, the balance of weapons Reach offered up was darn near perfect and plenty of fun to experiment with. The armor abilities were a much more intelligent implementation of the rather awkward equipment introduced in Halo 3. The Vehicles were largely familiar, though a couple of new additions felt right at home in the UNSC and Covenant squadrons respectively. The campaign is decently lengthy, and the highest difficulty setting offers up a genuinely challenging trek that requires a far more careful and tactical approach without feeling the least bit aggravating or unfair. As for the multiplayer side of things, Halo: Reach’s offerings may not be as consistently high caliber as Halo 2’s maps, but many of them return in the form of remakes (whether full-fledged, or variations in the make-whatever-your-heart-so-desires expanse of Forge World). Classic game modes like Slayer and Infection return, while a few new modes like Headhunter and Invasion may be drastically different in their implementation (the former being silly and frenetic, the latter requiring finesse and teamwork) but are a blast to partake in. Add in Firefight, a team-based mode where waves of Grunts, Jackals, Brutes, Elites, and the occasional Hunters advance toward your location, and you have the most complete package a Halo title has ever offered. When it all boils down to it, the story of Noble Team’s last stand on Reach is basically a countdown to extinction. But the presentation is damn good, from Marty O’Donell’s masterful soundtrack, to the oddly gorgeous decay of a planet ravaged by battle. Though chronologically Halo: Reach takes place prior to the original Halo, there’s little more I could ask for from Bungie in bringing a conclusion to their long-running series. Nobody knows the Halo property quite like Bungie. I consider the original Metroid Prime one of the most bold and successful revivals of a video game franchise ever attempted. I also consider it to be one of the best video games ever created. While I enjoyed the sequel Metroid Prime 2: Echoes and its light world/dark world scenario, the layout of planet Aether’s different regions did not feel as intelligently crafted as the regions of Tallon IV in the first game. 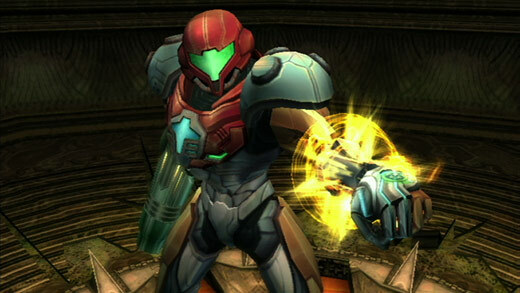 Whereas the distance between save stations, weapon upgrades, and the balance of puzzles and combat was relatively consistent in Prime, it was more sporadic in Echoes – Samus could traverse incredibly short distances at times and come across a number of missile expansions or quick and easy environmental puzzles, or it could be close to an hour between two save stations. Metroid Prime 3: Corruption was one of the earliest big-name titles Nintendo revealed for their Wii (or as it was known at the time, the Revolution). While the original reveal trailer didn’t show much, the final product turned out to be a balance of familiar and fresh content. No longer was Samus limited to a single planet – in their alliance with Dark Samus, the Space Pirate forces had spread Phazon across the galaxy, requiring Samus to visit multiple worlds and undo the gradual infection and mutation brought on by the Phazon. While these individual planets were scaled down in size from the regions of the previous two Prime titles, they were still bold visions on the part of the creative team at Retro Studios. The skylines that run above the clouds of Elysia, the needle-like forests of Bryyo, and the haunting remains of the G.F.S. Valhalla all made for areas that were as interesting to look at as they were to explore. For being one of the earliest titles to make full use of the Wii’s motions controls, Metroid Prime 3: Corruption is arguably among the best on the system. Response times and targeting accuracy might not be perfect, but they’re pretty great even when you compare them to later Wii releases by Nintendo. Prime 3 spends as much time exploring the core mythos of the Metroid universe – the legacy of the Chozo, the properties of Phazon, the role of the Aurora Units and the connections they share to Mother Brain – as it does providing a satisfying conclusion to the story that makes up the Prime trilogy. To that end, Corruption does as much to send the Prime series out with a bang as it does to connect the dots of many underlying tales that helped to shape the Metroid story at large. Final Fantasy XIII does not use the exact combat system of its predecessors, but that’s kind of a pattern the series has followed all along – trying new spins on an old classic. 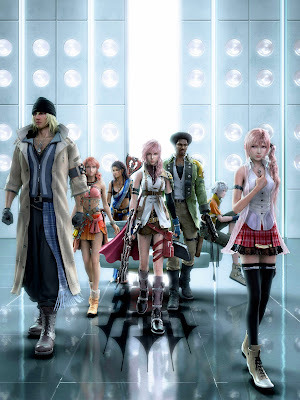 FFXIII utilizes a variant of the ATB battle system introduced way back in Final Fantasy IV, and puts you in control of three characters at a time, requiring you to rotate through your lineup of roles (known as paradigm shifts) in order to fight foes. While it is true that the game does not require you to be particularly involved with selecting specific attacks seeing as auto-battle will generally select the most useful magic or physical attack, FFXIII’s fast-paced combat will ask that you remain attentive and ready to switch party roles at a moment’s notice. As a result, the combat is less chaotic and frenetic and more fluid and methodical. The only real gripe that I have with Final Fantasy XIII is that the side quests are all centered around the concept of tracking down increasingly stronger creatures and slaying them in order to unlock Xbox 360 achievements/PS3 trophies. While you can technically continue grinding during the game’s later hours in order to fully level up your party members and expand their crystarium, the roles you’ve assigned them up to that point should complement each other impeccably – each character basically starts off on two primary roles (in the case of Snow, these are Sentinel and Ravager), and then a third is recommended to both further specialize your party members as well as cover potential gaps in your strategies. Unlike many a JRPG, it offers opportunities for grinding for experience points without actually requiring it. For my first foray into the core Final Fantasy games, FFXIII was a strong start. It’s not perfect and I have since discovered elements of other Final Fantasy titles that I prefer over some of what FFXIII has to offer. But nearly everything that FFXIII brings to the table is handled very well. During the forty plus hours it takes to complete the main game, there is ample time to develop each of the six main characters as well as explore the lore of the Fabula Nova Crystallis universe without the terminology going completely over your head. I loved Lightning and Sazh, I came to appreciate Snow, Fang, and Hope and everything they offered to the party. But in a most unexpected turn of events, Vanille, the bubbly girl who I expected might get annoying rather quickly, proved to be the most deep and engaging of the bunch. A proper sequel to Metal Gear Solid 3: Snake Eater, Peace Walker explores the impact the Boss’ training and philosophy have had on Snake in the years following her death. It’s very much a story about Snake – in typical Metal Gear fashion, there are plenty of other cast members to intrigue players, to flesh out the experience, and to better connect the dots that make up the Metal Gear lore. But through all of Kazuhira Miller’s radio chatter it’s quite clear that this is the story that is meant to bridge the gap between the Naked Snake era and the rise of Big Boss’ Outer Heaven. David Hayter puts on a more gruff tone to convey how Snake has aged both physically and emotionally, and the shift in his presentation of this iconic gaming character goes a long way in sowing the seeds of both Big Boss’ new identity and the goals of the Militaires Sans Frontieres. Much like with MGS3, Peace Walker offers a slightly greater range of freedom with picking an approach to countering Snake’s foes. You can distract them by making noise and then carefully sneaking around them, or you can take them head on thanks to a more-powerful-than-usual arsenal. A few of the boss fights do require a more straightforward combat approach, as foes will attempt to flank Snake and force him out of a well-defended spot. This results in the need to balance your strategy between taking out these lesser enemies and dealing blows to the tank, helicopter, or mech that is Snake’s primary target. While the individual areas in Peace Walker are nowhere near as expansive as those in MGS3, they are still structured as a series of connected sectors. For a handheld game, these look gorgeous due to their high level of detail. The soundtrack is classic Metal Gear and, again, of impressively highly quality. 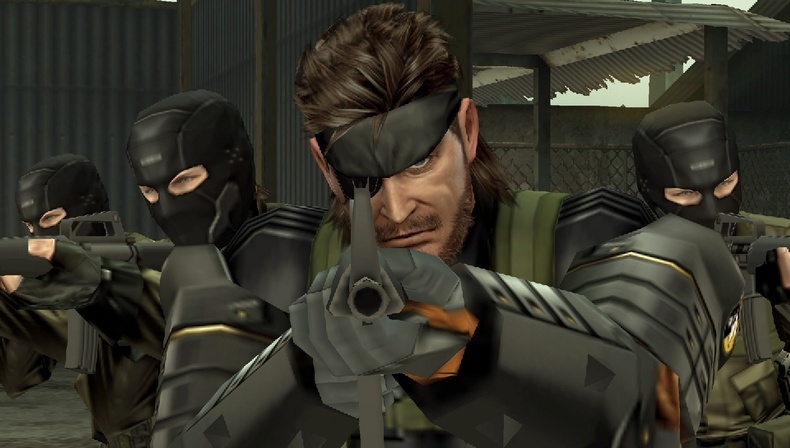 The multiplayer mode and RPG elements worked into building Snake’s forces are both unusual choices for a Metal Gear title, but they work surprisingly well. Peace Walker is a bold spin on everything you’d expect from a Metal Gear game – at its core, it’s the same tactical espionage action you’ve come to know and love. But the gameplay elements give it a whole new flavor that makes it a fresh experience for MGS veterans. Peace Walker is not only among the best entries in one of my personal favorite video game franchises, it’s one of the best handheld titles I’ve ever played. Now that the big three game companies have all announced their new consoles, I thought I would take a look back at my favorites from the Wii/PS3/Xbox 360 era. I realize that what is soon to be dubbed ‘last generation’ isn’t actually over yet and there is a chance that some more truly impressive games might be released between now and the time that the Wii U/PS4/Xbox One take over completely. But as of right now, I feel that my list of favorite/most important games from this past generation will see little-to-no alteration, even with new games still on the horizon. The criteria for this list is as follows: all of the games listed below are among my favorites of this past generation, and have been placed in order of which I think were actually handled best, from gameplay, to storytelling, to graphical/artistic presentation, and overall production quality. A few series had sequels that were competing for a spot on this list, and because of how close it came between some of them, I’ve opted to include both as a single spot on the list. Keep in mind that this list is drawing from a large pool - everything from the Wii, DS, PS3, PSP, and Xbox 360. Also, re-releases of a game are not eligible – no Virtual Console or HD Collections, I'm afraid. However, full-fledged remakes are allowed. If your favorite game didn’t make the list that simply means that either I didn’t play it or it didn’t leave as significant an impact on me. While the original Portal was certainly a landmark game for its physics engine and combination of puzzle and platforming gameplay, it lasted but a few hours. They were an enjoyable few hours, to be sure, but left less of an impression that I had played a ‘masterpiece’ and more the impression that I had played something that was a crossroad – not just for the aforementioned genres of video games, but for the medium as a whole. 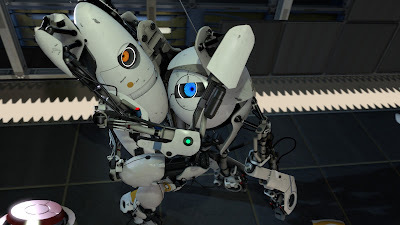 In the years that followed Portal’s release, there was seemingly no end to the number of developers who attempted to pay tribute to the game by including not-so-subtle references to false promises of cake and the instantly recognizable companion cube. But for so many that gave their individual nods to the game, there were few that dared try and replicate something like Portal. Enter Portal 2, a sequel released four years after the original, which built and expanded upon everything the original created. Portal 2 once again follows protagonist Chell, but through a full-fledged story instead of a one-sided conversation with power-mad AI GLaDOS. It’s true that Chell is still silent, but Wheatley acts as both narrator and companion, while the other cores (brief though their appearances may be) and the recorded audio from Aperture founder Cave Johnson add a lot of life to the equation. The original Portal, while entertaining in its own right, did not feel to me as complete of a product as Portal 2. The addition of gels added a new dynamic to the gameplay, and a few of the puzzles were real stumpers. As for the flawlessly-executed co-op mode, that was simply icing on the cake. Nintendo revealed the new Smash Bros. at E3, and while I felt the expo as a whole was rather lackluster in comparison to previous years, the Smash Bros. reveal was certainly one of the highlights for me. I’ve never been real big on the Megaman games, but after Brawl opened the doors to non-Nintendo characters, I had a feeling the blue bomber might be a good fit for the series. Apparently, Nintendo, Capcom, and Namco all felt the same way. As for the other two new fighters to be revealed, the Animal Crossing Villager looks a solid addition, if not a pretty basic fighter (perhaps the whole idea behind his inclusion is to present another balanced, easy-to use character like Mario). I was by no means surprised that many of his attacks saw him making use of tools like the axe and bug net, but I did get a chuckle out of his moves. As for the other big reveal, the Wii Fit Trainer, I found it downright hilarious, and in the best way possible. Her reveal trailer was just plain goofy, and based on her crazy moves that were shown off, I think ‘over-the-top and silly’ is the whole theme of her character. The Brawl roster contained thirty-five fighters, which (assuming this number is to remain the same) leaves twenty-three spots open. Personally, I expect most (if not all) of the clone characters to be dropped, while I expect them to keep all of the fighters from the original Smash Bros. – Captain Falcon, Ness, Jigglypuff, Luigi, and Yoshi. Luigi, while technically a clone character of Mario, is such a huge part of Nintendo’s brand image, and I can’t imagine them dropping him for any reason. Plus, his new moves in Brawl set him and Mario a little further apart from one another. While I didn’t expect Mr. Game & Watch's debut in Melee to be more than a cute bit of nostalgia from Nintendo, he made a return to Brawl, and I expect he will be back for this next installment, along with Zelda, Olimar (representing the soon-to-be-released Pikmin 3), Ice Climbers, and at least one of the Fire Emblem characters. Considering SEGA’s good relationship with Nintendo and their upcoming Wii U exclusive Sonic Lost World, I’d say their blue hedgehog mascot will almost undoubtedly return to the fight too. Assuming all of those predictions prove true, that would leave us with twelve free spots. So then the question is, who is left to fill them? Going solely off what was shown in the reveal trailer, there were two stages that really caught my attention. The first was a boxing ring, which had the Smash Bros. logo displayed in the center. It’s entirely possible that this is a brand new original Smash Bros. stage (much like Battlefield and Final Destination), but I wonder if it isn’t the home stage of Punch-Out protagonist Little Mac. The second was the Skyloft stage from The Legend of Zelda: Skyward Sword. Link’s appearance still seems to be based largely off his Twilight Princess counterpart, but he has a slightly different look than he did in Brawl. His tunic and the belts that run across his chest bear a striking resemblance to his Skyward Sword design (even though he does not bear any cel-shading), while his face is more angular and his nose slightly more pointed (again, much like Skyward Sword’s Link, or even Ocarina of Time’s). If this new look is in fact a nod to Skyward Sword, I think there is a decent chance that Ghirahim could replace Ganondorf on the roster. He’d certainly offer up a significantly different play style and would remove one of the clone characters in the process. I expect we’ll gradually learn more in the months leading up to this new Smash Bros. release. Maybe these exclusivity deals between Nintendo and Platinum Games will see the inclusion of someone from the Wonderful 101 as well? It seems like and appropriate fit for the franchise. As for me, I’m still hoping and praying that they put in Travis Touchdown. 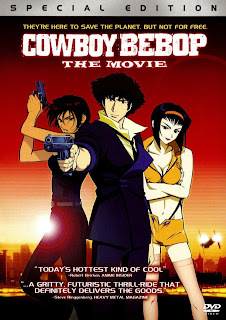 Effectively a side story to the main series, Cowboy Bebop: The Movie sees Spike, Jet, Faye, Ed, and Ein reunited for one more adventure on Mars. A man by the name of Vincent Volaju has been spotted on Mars and is seemingly responsible for a series of explosions within the capital city. As the crew of the Bebop works to connect the dots between Vincent’s true identity and the grander scheme he has in mind for Mars’ populous, they discover that the situation at hand may be more dangerous than any of them had anticipated. For a 2001 release, the film looks quite visually impressive. It is from an era when digital animation was starting to be phased in and traditional hand-drawn series being phased out, but the film looks very clean. The environments are in keeping with the gritty backwater setting that frequented the series, though both crowded narrow market streets and neon-lit arcades are brightly colored and highly detailed. The film utilizes some fun and unexpected camera angles at times – these are not overly frequent, but come into play enough to bump fights or chase scenes another step up from the excitement the series offered. Spike’s lanky form dodging throws and reloading clips is as fluid and well-animated as ever, and the same goes for Faye taking tight turns inside her ship the Red Tail, and Ed and Ein having fun in exploring nearby neighborhoods. While the soundtrack is just as enjoyable to listen to as ever, it opts for some grunge and alternative rock tunes over the series’ signature jazz tracks. There are a number of familiar faces that return, including the trio of elderly men and the Native American named Tribal Bull, though all see little more than brief cameos. The story hones in primarily on Spike, Jet, Faye, Ed, and antagonist Vincent, as well as Elektra, a rough-and-tough war veteran who is investigating Vincent’s string of attacks separately. Spike’s less-than-serious demeanor plays off her no-nonsense routine in a fun way, and the two develop a sort of unusual rivalry as they both seek the same individual – one of them playing by the rules, and the other paying them little heed. 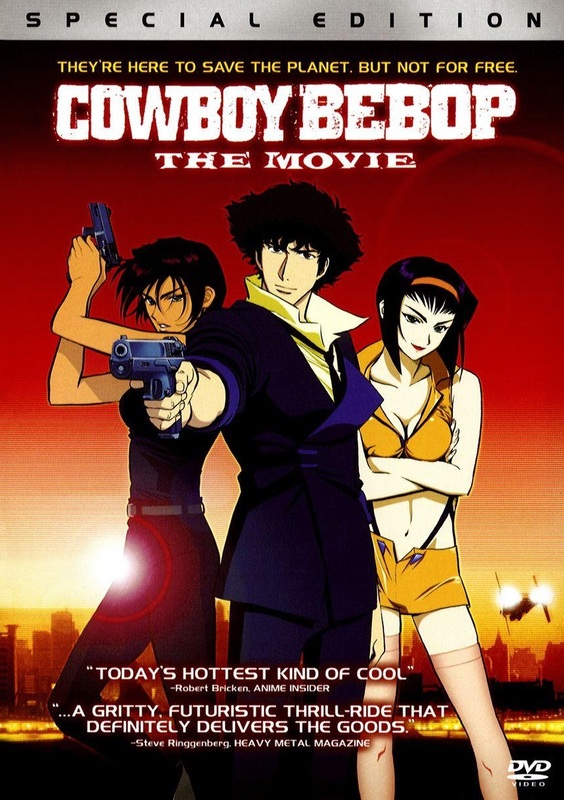 When it boils down to it, Cowboy Bebop: The Movie is a love letter to fans of the series. It may carry a slightly more serious tone than purely-for-laughs episodes like “Mushroom Samba”, but it doesn’t tread too near the notably darker territory of the original series’ finale episodes. One last adventure for the crew of the Bebop may not have been entirely necessary, and the film doesn't actually offer extra insight to the larger story or any further development of the main cast. Nonetheless, it’s an enjoyable ride. Gurren Lagann is effectively one giant satire on the mecha anime genre. Delightfully cheesy catchphrases like “Mine is the drill that shall pierce the heavens!” as well as the combination of two Gunmen to form the series’ titular mech harken back to the mecha boom of the 1980s. Meanwhile, the wastelands that team Dai Gurren traverse, the eventual foray into space, and the focus on character development ring closer to more modern takes on the genre. The series is split into two story arcs, with the first being slightly longer and of a slower pacing in order to familiarize viewers with the main cast and the desolate world in which they live. This arc, known as the Beastmen War, places the spotlight on Kamina, Simon, and Yoko as they fight the human-animal hybrids known as the Beastmen and rally allies as they forge a path toward the enemy’s capital city. Simon, having spent the majority of his life digging tunnels in his home city, is excited about the opportunity to venture into the wild expanses of the surface world, but is frequently uncertain of his own potential. Kamina prefers to dive headfirst into a battle, and while he might not always have a plan in mind, he constantly provides Simon with words of encouragement. Yoko, lacking a Gunman of her own to pilot, provides support with her powerful sniper rifle and seems to be the most gathered of the three. While Yoko sometimes finds herself frustrated with Kamina’s brash nature, it is quite obvious that she has a romantic interest in him after just a few episodes. The supporting cast is surprisingly large, especially for a series of this nature. Due to the action-heavy nature of Gurren Lagann it would be easy for the writers to use many of them purely as cannon-fodder and write them off as quickly as they are introduced, but this proves not the case. It’s true that not every character makes it to the finale, but the show does a solid job of rounding out each member of Team Dai Gurren enough to give you reason to care for them as well as tugging at your heartstrings a bit when one of them meets an early end. Granted, few of the supporting cast outside of flamboyant mechanic Leeron, hotshot pilot Kittan, and soft-spoken Rossiu do more than pilot their own Gunmen, but it’s an admirable effort to make viewers sympathize with the cast in a manner that seems neither forced nor distracts the focus of any given episode. 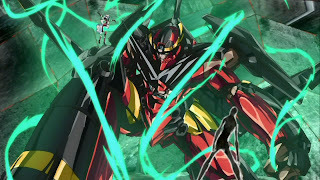 The animation is gorgeous throughout – perhaps even more so during the second story arc, due to the fact that the wasteland environments have been discarded in favor of a futuristic city setting filled with production model Gurren Lagann mechs as well as a journey across the Milky Way and beyond. 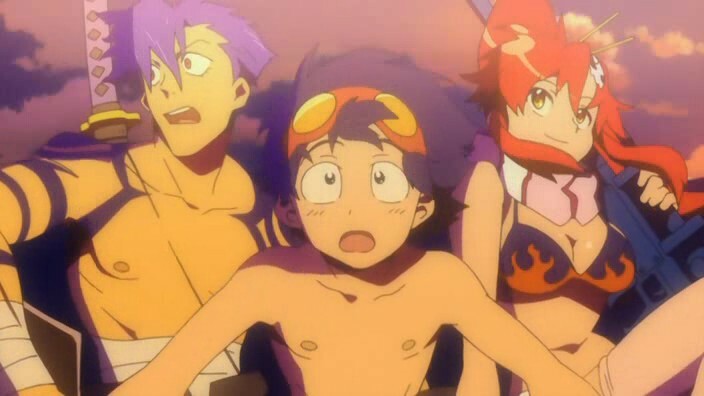 Bright colors like the red and yellow that decorate Gurren Lagann itself pop on screen, while the dark and dusty interior of the old underground human cities create a mysterious, almost sinister atmosphere. The Gunmen perform many dynamic (and often ridiculous) actions as they combine with one another, dash up mountainsides, fly through the air, and exchange blows with their opponents. 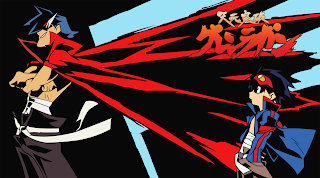 It’s hard not to find yourself cheering inside as Kamina and Simon perform one of their silly signature attacks, whether it’s a set of giant sunglasses being flung like a boomerang or the Giga Drill Break tearing an enemy to shreds. Gurren Lagann does not spend much time explain its backstory. Rather, it opts to show the audience just what sort of a world the characters live in and how the Gunmen operate as a faction. There are a few episodes that are dialogue-heavy and spend a decent amount of time exploring how the world came to be in the position it is now, but by and large Gurren Lagann is a series that knows just what its fans want to see – borderline-ludicrous fighting robot action. In fact, most of the ‘story exploration’ occurs during the latter episodes of the first story arc and the first half of the second story arc. This lends to the second story arc feeling a bit less action-heavy at first, but ultimately the payoff is nothing short of superb. For a show that follows so many of the conventions Gainax has set forth in their anime over the years, the finale – thankfully – avoids the ‘Gainax ending’ syndrome so many in the anime community have come to hate. 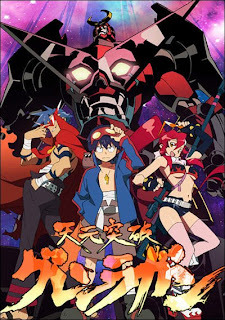 Above all else, Gurren Lagann is just plain fun to watch. While perhaps not the most mind-blowing anime to be released by Gainax, the combination of colorful characters and way over-the-top action makes for one of the most genuinely entertaining viewing experiences I’ve had with an anime in a long while. Its pacing, atmosphere, and themes are consistent throughout, so don’t expect any transitions to dark territory in the style of Neon Genesis Evangelion. Instead, strap in for some intense mecha action, good laughs, and positive vibes (and don’t feel bad if you find yourself marathoning episodes because you are unable to put it down). Anime update: Row, row, fight the power! In addition, I’ve nearly finished viewing Steins;Gate, and am a little less than halfway through my viewing of Gurren Lagann. I also have Tekkon Kinkreet in my collection, and have simply neglected to pop it into my DVD player as of yet, so there is a chance that film may be reviewed early this summer as well. As for the Toonami block, I’ve grown a little frustrated with their insistence on altering the schedule to accommodate earlier time slots for Bleach, Naruto, and One Piece, three anime which I have neither patience for nor any interest in. However, I have found Soul Eater quite entertaining, and I plan to follow it through to its finale. I’m really hoping that Toonami picks up some new shows this summer to present greater variety – at the moment, I’m really only tuning in for Soul Eater and IGPX, as I’ve already seen Thundercats, Fullmetal Alchemist: Brotherhood, and Cowboy Bebop through to completion. Inuyasha (while enjoyable enough) is on far too late for me to stay up and watch, and Eureka Seven really isn't my cup of tea. Admittedly, I am a bit behind with Unicorn Gundam and have been meaning to catch up on everything that has been released since episode four (where I last left off). I plan to return to watching Victory Gundam before the end of the year, and I’d like to give another old anime, Space Runaway Ideon, a shot, as it is another of Tomino’s works and is apparently something of a spiritual predecessor to both Zeta Gundam and Neon Genesis Evangelion (two of my personal all-time favorite anime).